Drum corps will return to theaters for Big, Loud & Live 10, the live broadcast of the 2013 World Championship Prelims coming to more than 600 theaters nationwide, Thursday, Aug. 8. 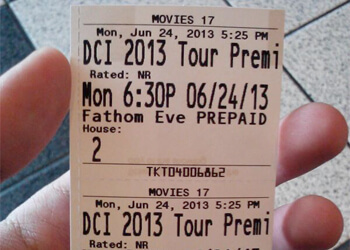 Drum corps fans flocked to the theaters Monday, June 24, for the 2013 DCI Tour Premiere cinema event. Shown in more than 450 movie theaters nationwide, the one-night-event showcased the early-season performances of six of DCI's World Class corps.